With Andrew McGregor. Including Building a Library: Berg: Violin Concerto; New opera releases including Wagner, Gluck and Mozart; Disc of the Week. Kate Molleson compares recordings of Berg's Violin Concerto which was written after the death from polio of 18-year-old Manon Gropius, the daughter of Alma Mahler. Berg dedicated the concerto "To the memory of an angel". It has come to be one of his most popular works. Andrew talks to Iain Burnside about a fascinating batch of new opera releases including Wagner's Das Rheingold, Gluck's Orfeo ed Euridice and Mozart's Entfuhrung aus dem Serail. Choir: King's College Cambridge Choir. Ensemble: His Majestys Sagbutts and Cornetts. Conductor: Stephen Cleobury. Singer: Hana Blažíková. Ensemble: L’Arpeggiata. Conductor: Christina Pluhar. Performer: Alina Ibragimova. Performer: Jonathan Cohen. Ensemble: Arcangelo. Performer: Alan Hacker. Ensemble: The Music Party. Singer: Arleen Augér. Orchestra: Handel and Haydn Society Orchestra. Conductor: Christopher Hogwood. Performer: Robert Levin. Ensemble: Academy of Ancient Music. Conductor: Christopher Hogwood. Singer: Rachel Yakar. Singer: Alicia Nafé. Singer: Georgine Resick. Orchestra: Drottningholm Court Theatre Orchestra. Choir: Drottningholm Court Theatre Chorus. Conductor: Arnold Östman. Performer: Christopher Hogwood. Singer: Martyn Hill. Singer: Franco Fagioli. Conductor: Laurence Equilbey. Orchestra: Insula Orchestra. Music Arranger: Thibaut Perrine. Singer: Franco Fagioli. Orchestra: Insula Orchestra. Conductor: Laurence Equilbey. Singer: Mari Eriksmoen. Conductor: René Jacobs. Orchestra: Academy for Ancient Music Berlin. Mozart: Die Entfuhrung aus dem Serail. Singer: Dimitry Ivashchenko. Singer: Julian Prégardien. Orchestra: Academy for Ancient Music Berlin. Conductor: René Jacobs. Singer: Robin Johannsen. Singer: Maximilian Schmitt. Singer: Mari Eriksmoen. Singer: Julian Prégardien. Singer: Dimitry Ivashchenko. Orchestra: Academy for Ancient Music Berlin. Conductor: René Jacobs. Singer: Mark Padmore. Singer: Sally Matthews. Conductor: Sir Simon Rattle. Schumann: Das Paradies und die Peri. Singer: Sally Matthews. Conductor: Sir Simon Rattle. Singer: Tomasz Konieczny. Singer: Mirella Hagen. Singer: Stefanie Iranyi. Singer: Eva Vogel. Orchestra: Bavarian Radio Symphony Orchestra. Conductor: Sir Simon Rattle. Singer: Michael Volle. Singer: Elisabeth Kulman. Singer: Annette Dasch. Orchestra: Bavarian Radio Symphony Orchestra. Conductor: Sir Simon Rattle. Singer: Benjamin Bruns. Singer: Michael Volle. Orchestra: Bavarian Radio Symphony Orchestra. Conductor: Sir Simon Rattle. Kate Molleson compares recordings of Alban Berg’s Violin Concerto and makes a personal recommendation. Andrew listens again to recently rereleased recordings of music from the Classical and Romantic periods, taken from a new 50CD L’Oiseau-Lyre box set. Works by Stamitz, Boccherini, F.J. Haydn, Mozart, Beethoven, Weber, Hummel, Crusell, Krommer, Schubert, Mendelssohn, Glinka and Liszt. 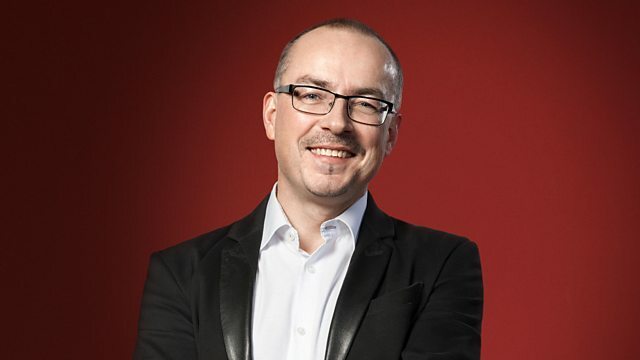 Andrew is joined by pianist Iain Burnside to discuss recently released opera recordings.